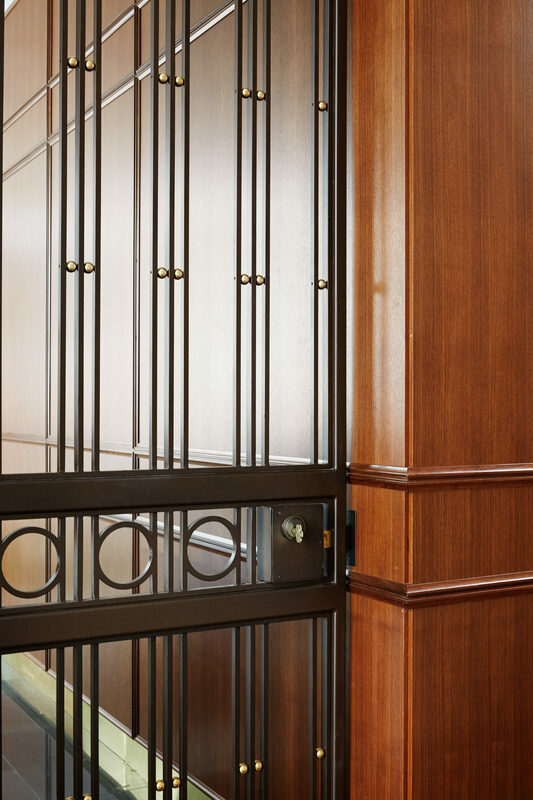 The foyer opening onto a 2500 square foot terrace, custom wrought iron gates are used to secure the apartment from the elevator which opens directly into the unit. 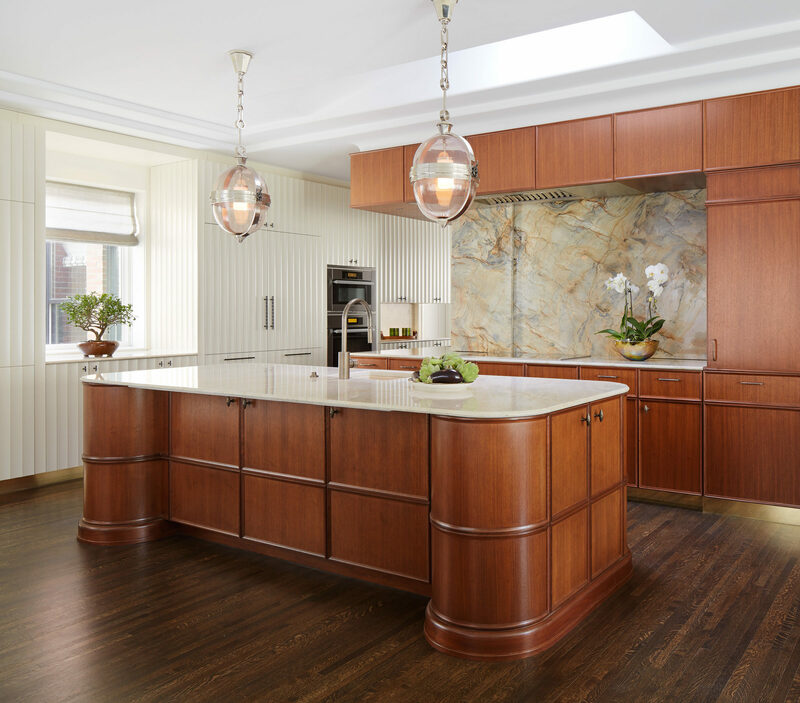 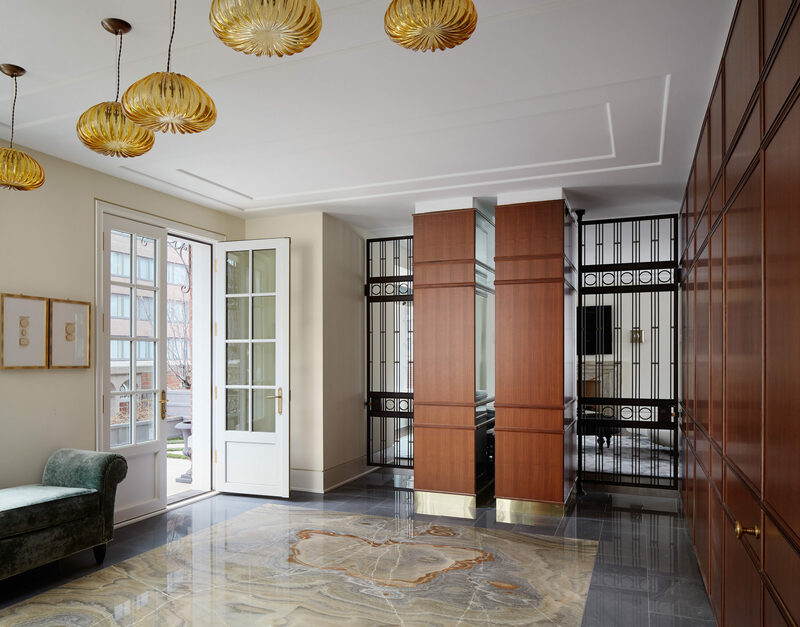 The unadorned space floor plan allows guest to fully appreciate the amazing beauty of the quartzite stone “rug” The rosewood paneled walls with satin brass base play a strong, yet quiet supporting role as do the amber Murano glass blown pendants. 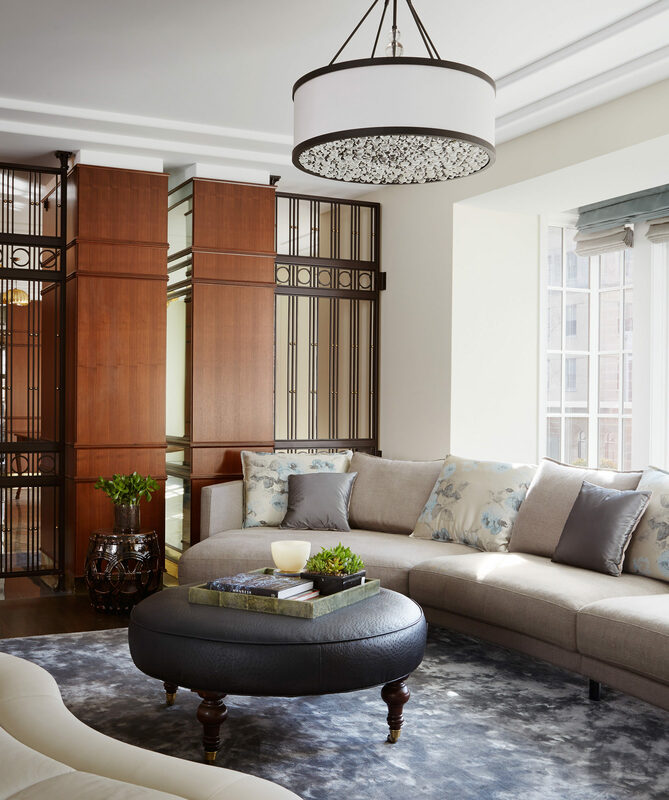 Morgante Wilson Architects designed this Living room on the other side of the foyer, features a blue water effect silk rug, grey leather ottoman/coffee table and curved custom Italian sofas. 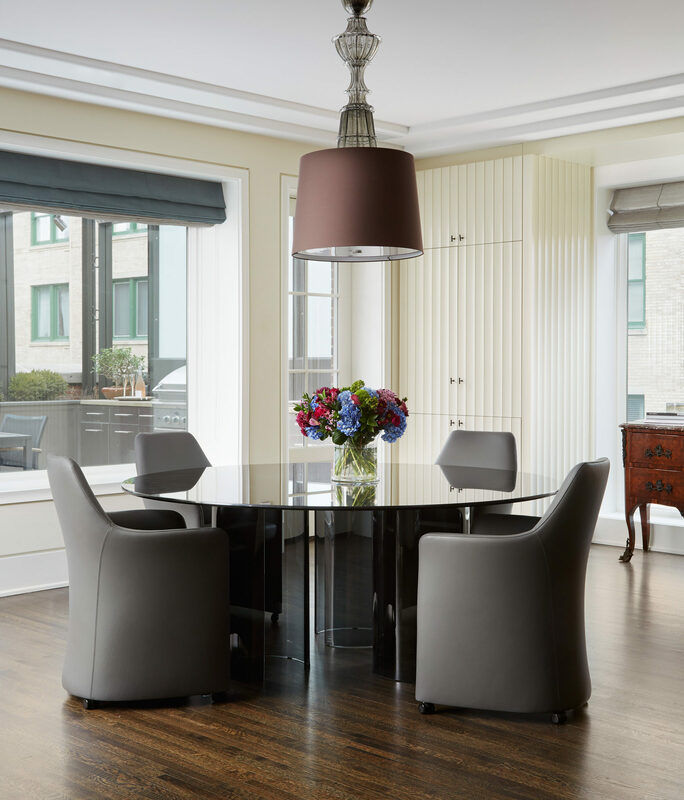 The seating group is punctuated by a glass bubble chandelier. 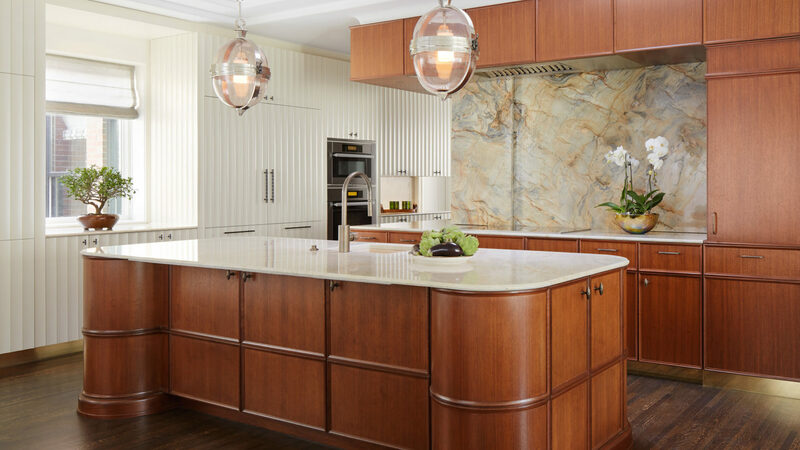 Because the living room, dining room and kitchen is a large single room, the custom designed kitchen cabinetry, is made all from of a ribbon of mahogany. 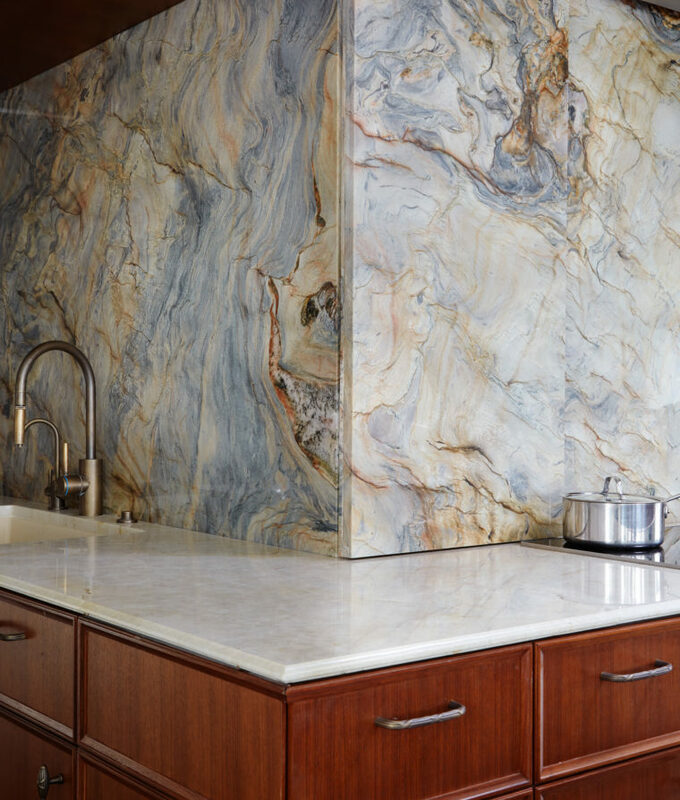 The paneling wraps the entire core of the building, unifying the entire apartment, which is a complete open floor plan, with the exception of the bedrooms, and conceals everything including kitchen appliances, all types of storage is ingeniously hidden, even the rolling back-splash that hides shelves. 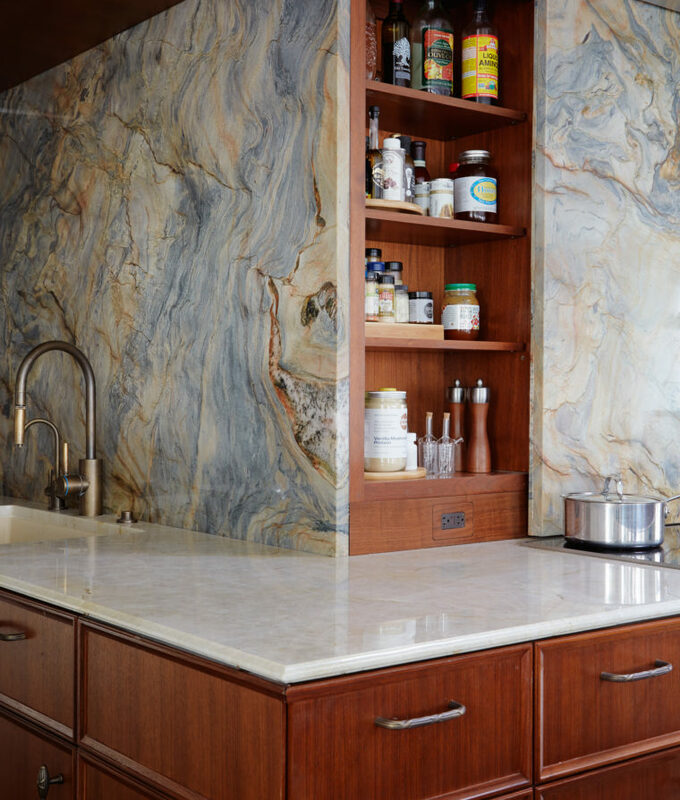 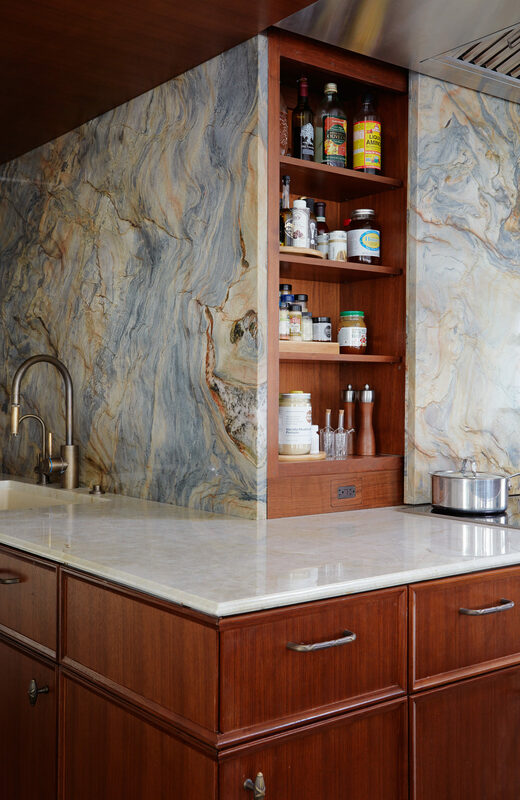 Morgante Wilson Architects designed custom fitted cabinetry throughout the apartment is a huge contributor to the gam factor with gorgeous scalloped face fronts finished in a rich cream lacquer. 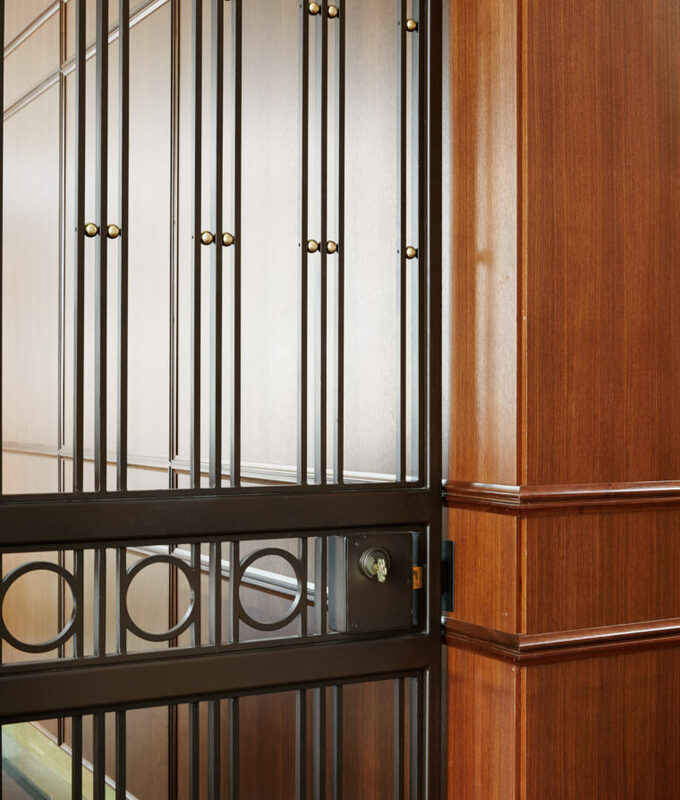 It provides tons of storage and also creates a special home for a signature keepsake bear of homeowner’s grandmother. 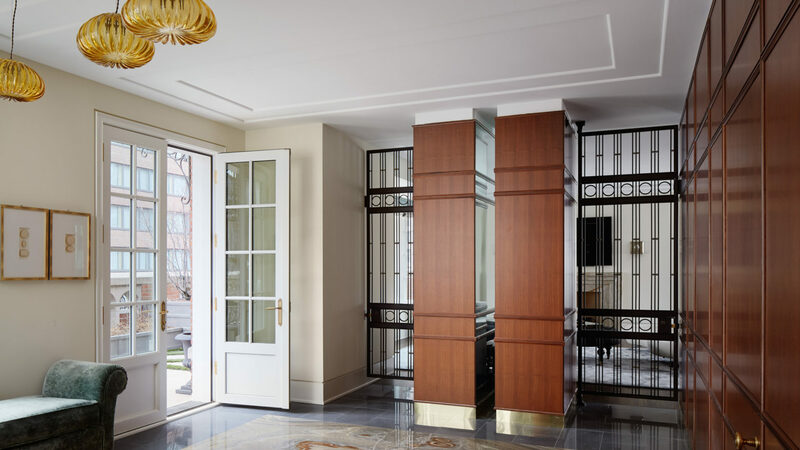 The library is a cozy space featuring an alabaster fireplace surround giving the vintage penthouse a warm comfortable feel. 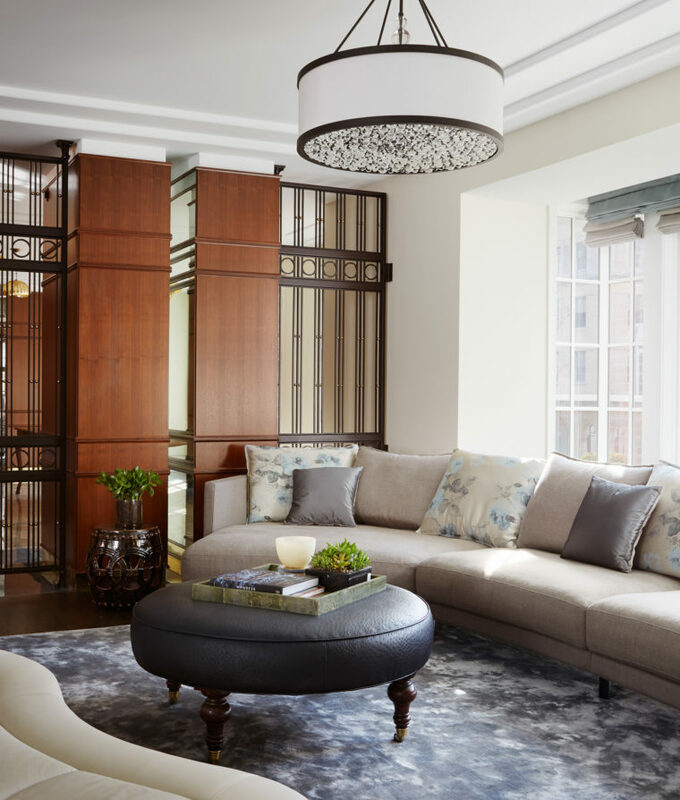 Morgante Wilson designed a custom mahogany dressing room, featuring both natural and artificial light is located just off the master bedroom and laundry area for easy access. 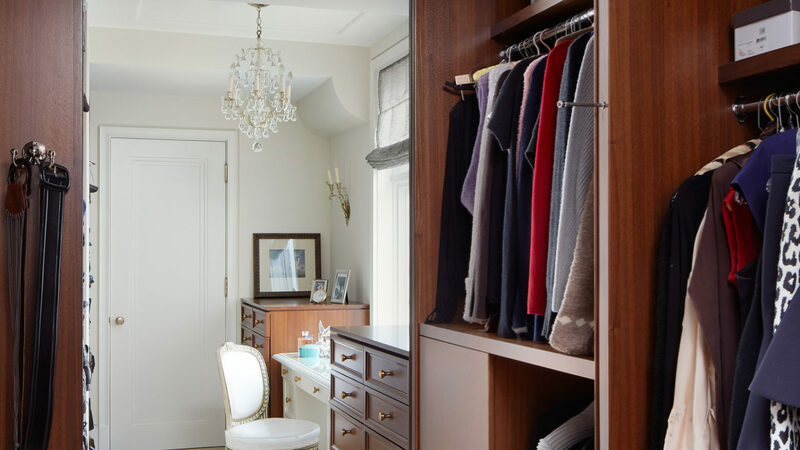 The closet is elegant and spacious accommodating both the husband and wife and it features a vanity table, complete with her grandmother’s antique chair. 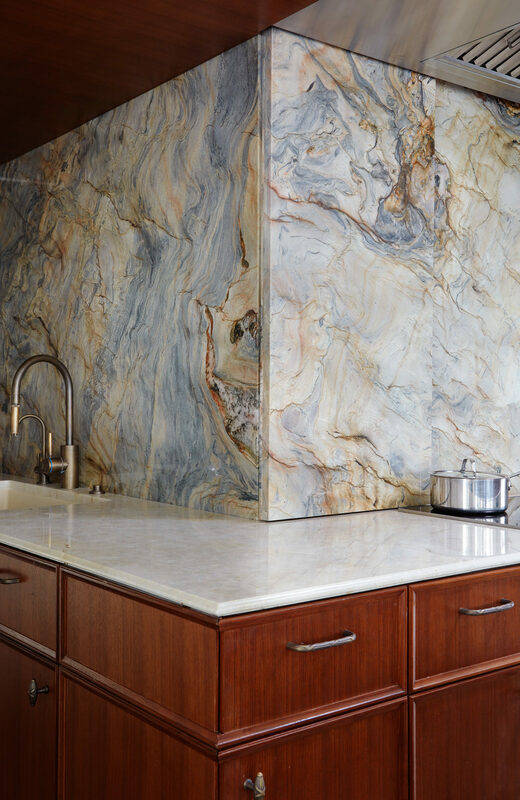 Making it a sentimental getaway for the woman of the house.